Effortlessness. This easy one-piece jumpsuit with belt keeps momentum no matter the season. Pair it with booties and a denim jacket for fall and sandals and scarves for spring and summer. The leg length looks fine on my 5'3" height. The regular size small fit me true-to-size. The navy print is pretty and later I ordered the black as well since this style is offered at a sale price. The BACK ZIPPER is inconvenient, though, when I need to use a bathroom. 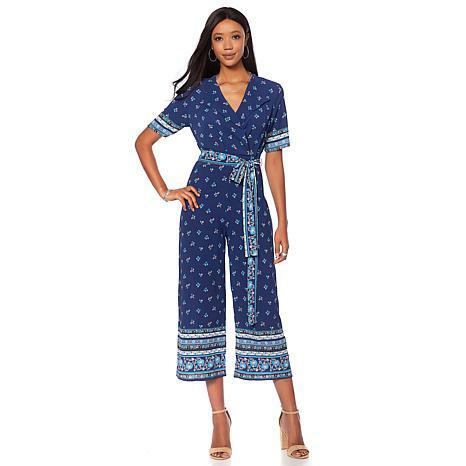 I would like to find a full-length jumpsuit for petites with a more convenient zip-front or button-front closure. This is a very cute jumpsuit. Looks great on. Bought it in blue. Unfortunately, I had to return it, as I live alone and I am not a contortionist. Forget using the restroom. Zipper should be in the front or on the side, not located on the back. Really disappointed that I had to return it. If they move the zipper, I will definitely buy again.